In its roughly 30th installment of "Red Century," a weekly series of op-eds dedicated to the notion that 20th century communism wasn't all that bad, the New York Times performed a bit of perhaps inadvertent recycling. On Monday, Helen Gao, in an item the Times appears to have had the good sense to keep out of its print edition, argued, with "crucial caveats" (but not enough of them) that "the Communist revolution taught Chinese women to dream big." Times columnist Nicholas Kristof infamously said much the same thing in 2005. Another result of the Trump administration: It has made die-hard anti-Communists out of the New York Times. After Trump accused fake news purveyors of being an “enemy of the people," the Times talked about the depredations of international communism on its front page Monday, if only to compare Trump to Josef Stalin and Mao Tse-tung. Andrew Higgins' dispatch was headlined “Phrase With a Venomous Past Now Rattles American Politics" and came complete with a photo of Soviet dictator Nikita Khrushchev. On Friday's Hardball, Chris Matthews and Howard Dean slammed the supposedly "lunatic" Republican Party for opposing President Obama's $3.7 billion request to deal with the ongoing crisis at the U.S-Mexico border. Dean likened the political stalemate over this issue and in general in Washington to McCarthyism in the 1950s: "It reminds me of the 'who lost China' debate...where one side is frothing at the mouth and finding communists under every bed; and the other side – including some reasonable Republicans...actually trying to run the country." A pathetic, obsequious act on the part of an establishment press member was exposed as utterly foolish mere days after its appearance. Sunday, Alexa Olesen at the Associated Press wrote an item headlined "One-child policy a surprising boon for China girls." My immediate comeback: "43-60 million Chinese girls aborted because they were of the 'wrong' gender or would have violated the one-child policy were not available for comment." While nowhere near as odious as Nick Kristof's "Mao Tse-tung wasn't all that bad; look what he did for Chinese women" conclusion at the end of a book review on Mao's murderous legacy almost six years ago, Olesen gets into the neighborhood. A UK Independent item about an unreleased book by historian Frank Dikötter made me think about New York Times columnist NIcholas Kristof. Readers will see why shortly. Amazon says that Dikötter's "Mao's Great Famine: The History of China's Most Devastating Catastrophe, 1958-1962" will be released on September 28. The Independent's Arifa Akbar relays Dikötter's core conclusion that "At least 45 million people were worked, starved or beaten to death in China over these four years." This is a significantly higher number than the highest previous estimate of Jung Chang, who asserted in her 2005 book, "Mao: The Unknown Story," that "38 million people were starved and slave-driven to death in 1958-61." The seven million extra deaths would move Chang's 2005 total of "more than 70 million" into the neighborhood of 80 million, padding Mao's lead over Stalin and Hitler as the worst mass murderer in human history. The Independent's Akbar also writes that "Mr. Dikötter is the only author to have delved into the Chinese archives since they were reopened four years ago." If true, this reflects a startling lack of curiosity. Fox News' Glenn Beck isn't catching a break anywhere - from "Saturday Night Live," The New Yorker, Al Gore's Current TV and Comedy Central's "South Park." They have all taken shots at the popular TV host. On his Nov. 16 program, Beck responded to the "South Park" interpretation of him - that he wasn't making accusations, but phrasing them in the form of a question. The show's character Eric Cartman played a spoof of Beck in which he railed against his school's president, Wendy Testaburger. Beck maintained he wasn't making the "accusations" in the form of a question - but playing the words of the "accused" themselves. "Have we gotten to a place you can't ask questions?" Beck asked. "What were my crazy accusations or questions? Well, the accusation was that Van Jones was a communist revolutionary," Beck said. "I didn't describe him that way. In his own words he described himself that way. He was a 9/11 Truther. He was forced to step down. Was it that the administration was using NEA as a propaganda arm for the administration? That was a question. We played tapes of the call with Yosi Sargent and Yosi Sargent had to step down." This won't surprise anyone who reads this blog regularly, but it needs to get on the record nonetheless: The airing of a June video showing interim White House Communications Director Anita Dunn praising Mao and Mother Teresa as "two of my favorite philosophers" to a group of high school students is barely news in the establishment press. 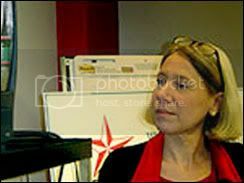 In an August 2008 report on the Obama campaign, Anne E. Kornblut of the Washington Post also described Dunn as "as senior adviser" who had joined the campaign "in the spring." Roger Kimball at Pajamas Media has the video of Dunn's speech. NB's Jeff Poor (covering Glenn Beck's original broadcast that broke the story) and P.J. Gladnick (on Dunn's pathetic attempt to excuse herself) have previously dealt with Dunn's speech.